Grant, almighty God, that we may glory in the Feast of the blessed Apostle Thomas, so that we may always be sustained by his intercession and, believing, may have life in the name of Jesus Christ your Son, whom Thomas acknowledged as the Lord. Who lives and reigns with you in the unity of the Holy Spirit, one God, for ever and ever. St. Thomas, the disciple who at first did not believe, has become for the Church one of the first witnesses to her faith. She is fond of appealing to his testimony and frequently puts in our mouths those simple words whereby he expressed the fervour of his regained faith: "My Lord and my God." It is known that St. Thomas preached the Gospel in Asia beyond the frontiers of the Roman Empire, probably in Persia and possibly as far afield as India. St. Thomas' feast was formerly celebrated on December 21. According to the 1962 Missal of Bl. John XXIII the Extraordinary Form of the Roman Rite, today is the feast of St. Irenaeus, Doctor of the Church, who wrote many important works of which the most famous is his Adversus Haereses, Against the Heresies, in explanation of the Faith. His feast in the Ordinary Form is celebrated on June 28. Historically today is the feast of St. Leo II, one of the last Popes of the early Middle Ages. His short pontificate (682-683) was marked by the confirmation of the sixth ecumenical council at which the Monothelite heresy was condemned. St. Leo II also perfected the melodies of the Gregorian chant for the Psalms and composed some new hymns. There is very little about the apostle Thomas in the Gospels; one text calls him the "twin." Rarely during Jesus' lifetime does he stand out among his colleagues. There is the instance before the raising of Lazarus, when Jesus was still in Perea and Thomas exclaimed: "Let us also go and die with Him." Best-known is his expression of unbelief after the Savior's death, giving rise to the phrase "doubting Thomas." Nevertheless, the passage describing the incident, had as today's Gospel, must be numbered among the most touching in Sacred Scripture. In the Breviary lessons Pope St. Gregory the Great makes the following reflections: "Thomas' unbelief has benefited our faith more than the belief of the other disciples; it is because he attained faith through physical touch that we are confirmed in the faith beyond all doubt. Indeed, the Lord permitted the apostle to doubt after the resurrection; but He did not abandon him in doubt. By his doubt and by his touching the sacred wounds the apostle became a witness to the truth of the resurrection. Thomas touched and cried out: My Lord and my God! And Jesus said to him: Because you have seen Me, Thomas, you have believed. Now if Thomas saw and touched the Savior, why did Jesus say: Because you have seen Me, Thomas, you have believed? Because he saw something other than what he believed. For no mortal man can see divinity. Thomas saw the Man Christ and acknowledged His divinity with the words: My Lord and my God. Faith therefore followed upon seeing." Concerning later events in the apostle's life very meager information exists. The Martyrology has this: "At Calamina (near Madras in India) the martyrdom of the apostle Thomas - he announced the Gospel to the Parthians, and finally came to India. After he had converted numerous tribes to Christianity, he was pierced with lances at the king's command." Patron: Against doubt; architects; blind people; builders; construction workers; Ceylon East Indies; geometricians; India; masons; Pakistan; people in doubt; Sri Lanka; stone masons; stonecutters; surveyors; theologians. Symbols: Spear and lance; carpenter's square and lance; builder's rule; arrows; five wounds of our Lord; girdle; book and spear; spear; t-square. Often Portrayed As: With a lance (because of his martyrdom) or with a square (because of the legend that he was sent as an architect to the king of India). Much has been written and said about Thomas' weakness of faith. St. Gregory the Great saw God's providential ways: The unbelief of Thomas has benefited us more than the faith of Magdalene. Should we not then reflect on our own failings? So often do we make the firmest resolutions to avoid this or that fault, and yet how easily we repeat it. Give some thought to God's ultimate purpose in permitting your faults and to how valuable for our soul's progress is the realization of our weakness and wretchedness. Pope Leo II was a Sicilian. He was learned in sacred and profane letters, as also in the Greek and Latin tongues, and was moreover an excellent musician. He rearranged and improved the music of the sacred hymns and psalms used in the Church. He approved the acts of the sixth General Council, which was held at Constantinople, under the presidency of the legates of the apostolic see, in the presence of the emperor Constantine, the patriarchs of Constantinople and Antioch, and one hundred and seventy bishops: Leo also translated these said acts into Latin. It was in this Council that Cyrus, Sergius, and Pyrrhus were condemned for teaching that there is in Christ only one will and one operation. Leo broke the pride of the archbishops of Ravenna, who had puffed themselves up, under the power of the exarchs, to set at naught the power of the apostolic see. Wherefore, he decreed that the elections of the clergy of Ravenna should be worth nothing, until they had been confirmed by the authority of the Bishop of Rome. He was a true father to the poor. Not by money only, but by his deeds, his labours, and his advice, he relieved the poverty and loneliness of widows and orphans. He was leading all to live holy and godly lives, not by mere preaching, but by his own life, when he died in the year 683, he had been Pope eleven months. 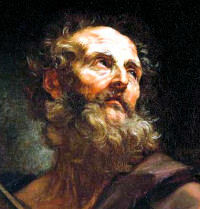 He was buried in the church of Saint Peter.